Euro Creations is today known as a reputable supplier and business partner providing luxurious European designer home furnishings in all styles throughout Thailand and Southeast Asia, helping our customers come up with their dream homes. 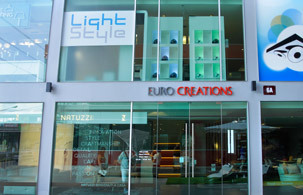 Now, Euro Creations opens our third branch in Phuket. The Natuzzi signature is comfort, built-in innovation and the ultimate manufacturing seal of their products, where every detail throughout each and every stage of production is carefully monitored: from the initial design to the prototype, from studying trends to choosing the upholstery, from the tanning of the leathers to assembly, and right through to delivery to your home. Royal Botania is luxury outdoor collection in modern and unique style. It is internationally well-known with its luxurious quality and design. Royal Botania uses premium quality of materials including stainless steel, aluminum and synthetic fibers to ensure the collection is perfect with design and function.